Anthony has strong interests in Medicine and Surgery within a global perspective. He is particularly intrigued by the continued revolution of clinical medical practice and research framed by the context of its historical evolution. As the article reports, there is a conspicuous lack of solid data investigating the relationship between pharmaceutical companies and medical students, particularly in Australia. Clearly there are both positive and negative aspects to this relationship, and I think the main concern many students hold is, at its roots, an ethical one. Can these companies exert an influence over our opinions about drugs, and subsequently affect our future prescribing practices? More importantly, does this have any relationship at all to accepting free gifts which might benefit our education? The ethics regarding this issue is a veritable maze of should, should-sometimes and should-nots, and as with many issues, ethics often takes a second place to convenience, and sometimes even third place behind convenience and greed. Naturally, this is not to say that medical students are either indolent or opportunistic, but the importance of this issue is undeniable, with many Australian medical students uncertain about how to deal with pharmaceutical gifts and promotions. From ethical principles, all moral individuals are bound by the Law of Reciprocity, which unequivocally states that we are disposed, as a matter of moral obligation, “to return good in proportion to the good we receive” – but how does this fit into the situation today? Can a moral person, regardless of whether they are a medical student, accept a gift, be it a pen, mug, lanyard or free sandwich, and not feel a sense of ethical obligation towards the giver? Carmody and Mansfield report that both doctors and students believe they possess a certain ‘invulnerability’ to any such nefarious ploys of inducing a reciprocal obligation, and as such feel free to accept small gifts without fear. Yet this is acting in direct opposition to the moral law of reciprocity, and consequently, does this mean we are acting unethically? While medical students may think that getting something for free is an obvious win-win situation, in reality nothing could be further from the truth. If anything, it’s one of those infuriating lose-lose situations. Accepting a gift means the beneficiary takes on a debt which may lead to a conflict of interest in the future, and in doing so acts unethically, something which is frowned upon quite seriously within the medical profession. With that said, there are positive sides to an early association between those studying medicine and the pharmaceutical industry. Disregarding the free pens, free food and other little (or not so little) gifts, pharmaceutical companies sponsor educational seminars, social outings and even travel costs to conferences. Surely this can only have a beneficial effect on our medical education. Or, should these too be considered ‘gifts’ of a different kind – gifts that will enrich us intellectually rather than materialistically? If nothing else, such an early relationship will help to prepare medical students for how to deal with the pharmaceutical industry after they graduate. The path ahead is not clear, for the relationship between pharmaceutical companies and medical students has both positive and negative effects. Barack Obama is reputed to have said that “If you’re walking down the right path and you’re willing to keep walking, eventually you’ll make progress”; yet how can we know where to place our feet if the ‘right’ path is hidden from us within a murky quagmire of ethical principles? Carmody and Mansfield suggest more research studies on this issue regarding Australian medical schools, and while I am not convinced this will make a pronounced change in clearing the fog obscuring the way forward, surely it cannot be a bad place to start. Carmody D, Mansfield P. What do medical students think about pharmaceutical promotion? 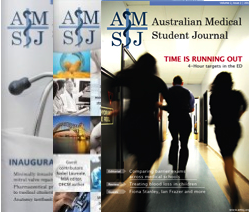 Australian Medical Student Journal 2010;1(1):54-7. Becker L. Reciprocity. 2nd ed. Chicago: Routledge & Kegan Paul; 1990. Wolfe S. Why do American drug companies spend more than $12 billion a year pushing drugs? Is it education or promotion? Characteristics of materials distributed by drug companies: four points of view. JGI Med 1996;11:637-9.